Let’s aim to finish this year and start the new one as we mean to go on – calm, collected, well rested, and full of zen. To even have a hope of doing this, we need to ensure we have ample sleep. Feng Shui is the ancient Chinese art of arranging living spaces to maximize the flow of chi (energy). They believe that if we do this, we increase our mental and physical health and wellbeing and create an environment of safety and productivity. Taking the time to think about how your bedroom is set up is important. It’s where you sleep and we all know that adequate sleep is very important to our overall health and wellbeing. 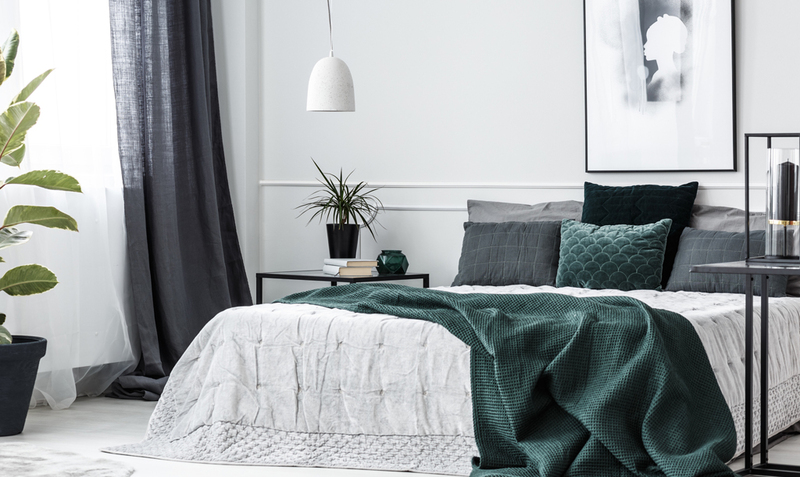 That’s why we’ve put together some easy steps to optimize the Feng Shui of your bedroom. The ideal place is a position where you can see the door but you aren’t directly in line with or opposite it. According to the principles of Feng Shui, having a view of the door – but not being too close to it – gives us a sense of safety and helps us to relax and fall asleep. However we should try not to have the foot of the bed pointing towards the door as this is known as the “coffin” position. If there is no where else to position the bed, try and add a table or footboard at the end to act as a buffer. Remove any clutter from your bedroom and also the path from your bedroom to the front door. This allows a uninterrupted flow of chi through your house. According to Feng Shui, clutter isn’t just an eyesore; it can actually block the flow of chi, disturb sleep, and prevent things in your life from moving forward. Neatness where you can’t see it counts as well – so no piling everything into the wardrobe and closing the door. Also avoid storing anything under the bed as this prevents the continuous flow of energy through the room. Having a mirror in your room is thought to reflect energy and could be the reason you’re not sleeping. It’s also thought to amplify worrying. If you need to have a mirror, try to hang it somewhere where it can be hidden when you’re sleeping. An absolute no-no is to place a mirror directly opposite your bed, especially if you share it with a partner. According to Feng Shui experts, this can promote the intrusion of a third party and encourage infidelity. According to the experts of Feng Shui, warm colours reminiscent of skin tone are thought to be the most relaxing in a bedroom. Cream, peach, beige, yellow, coral, tan or cocoa are ideal as they’re thought to be soothing. Light blues, greens, and lavenders are also thought to be conducive to sleep. But if you do go with a cooler palette try to avoid too many cool colours such as, greys and stark whites as these can interfere with relaxation. Double up where you can and try to have two of everything. Two bedside tables, two lamps, and an equal space either side of the bed. And where possible, opt for oval and circular shaped furniture rather than pieces with sharp edges.